Henry Isaac Stevens was born in London, in 1806, second son of Isaac Stevens and Elizabeth Young. He was probably Derbyshire's most prolific and accomplished architect. There are few details as to his early life but he probably studied at the office of Sir Jeffrey Wyatville who designed Bretby Castle with a William Martin. 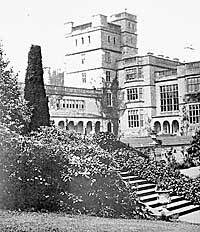 Henry Stevens married Martin's daughter Anne, at Repton in 1832. They had 4 children. By 1841 the family were living at no 3 The Terrace, London Road, Derby and Stevens had an office in the Corn Market. He was church warden of All Saints between 1842 and 1843 and by 1852 the family had moved to Mackworth. He designed over 30 churches, shops and many other public buildings. He served as a Tory Councillor in 1862-64 and again in 1866-69, and died in 1873.